In recent months I've trained hundreds of Biglaw partners on project management principles. In some of the earlier sessions, a handful of partners would sheepishly acknowledge that they had no idea project management was a term of art, that it referred to a disciplined approach to managing a series of interrelated complex tasks. Few now will admit to this blind spot, though among those who've heard the term most still don't know what it means for a law practice. To help demystify the concepts, my colleague Pam Woldow (now with Edge International) and I presented a webinar recently on Legal Project Management. (Click here to order the CD.) Of the many webinars I've presented, this session had one of the most active audiences. The questions were flying in from almost the moment we were underway. We addressed many of the points during the session, but I'll expand a bit more here. The commentary below is primarily addressed to those who've viewed the webinar or who already have a basic grasp of the concepts. First, what is Legal Project Management? Legal Project Management, or LPM, is the practice of applying tried-and-tested business practices used in other fields to the management of complex legal matters, both litigation and transactions. While designing and constructing a large skyscraper is very different from defending a corporation against claims of IP infringement or assisting a private equity firm to acquire a majority stake in a closely-held technology business, in many ways the techniques to manage budgets, to deal with scope change and to communicate expectations among stakeholders during the engagement mirror the challenges faced by lawyers managing these legal matters. Doesn't Legal Project Management apply only to commodity practices? LPM doesn't reduce the practice of law to a series of rote exercises that can be performed by any low-cost lawyer, ignoring all creativity and years of accumulated wisdom. In fact, LPM very clearly embraces such experience by ensuring that legal matters benefit from this learning curve, rather than treating each legal matter as if it's the first of its kind. Of course it's easier to take a systematic approach to legal matters if the matters are routine to begin with, but let's not kid ourselves. Very few legal matters introduce completely new concepts. Most law firms acknowledge this themselves by showcasing their lengthy deal lists and league tables. If they only handled truly new and unique matters and cases of first impression, then little of that past experience would be relevant. Then isn't Legal Project Management really just another name for Case Management or Matter Management? The concepts are related, but generally speaking Case Management and Matter Management are approaches to keeping track of the many aspects of legal matters with a particular emphasis on tracking costs. LPM casts a much wider shadow. The intent of LPM is not merely to track costs, but to control costs, to identify areas of variability in order to get in front of scope change before it happens. LPM emphasizes performing the right activities to achieve the desired outcome and not more, while being mindful of one's duty of care and the client's risk tolerance. Doing necessary work that a client will pay for is more efficient than doing unnecessary work that manifests itself in low realization rates. So Legal Project Management means sacrificing quality for lower cost? Not at all! We illustrate this challenge in our webinar in more detail, but these graphics are a good start. Imagine the firm that begins lawyering up when the client initiates a new matter, without properly understanding the client's needs, scope and budget. What results might be the 3-tiered wooden swing when what was needed is a simple tire swing. 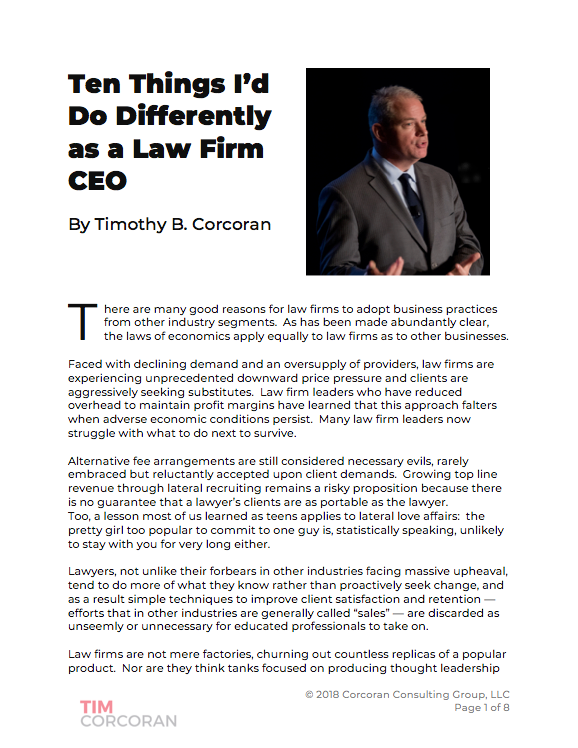 At times, clients do a poor job of articulating what they want; at times, chief legal officers don't fully understand what the business leaders want; at times outside counsel leaps to the conclusion that this client's fact pattern looks a lot like a prior and similarly-situated client's fact pattern, so work begins. To belabor the metaphor, the associate builds a wooden seat, and the senior associate demands two wooden seats, and the partner demands three wooden seats because eliminating risk means doing more work and because "clients hire us to be more thorough than anyone else." Is it compromising quality when we eliminate all lumber and woodworking from the matter, and instead provide the simple tire that fully meets the client's budget and expectation? Why would we involve clients? Won't they always demand more for less? That's one way to look at it. If your client doesn't trust you to do the necessary legal work at a fair price but no more, then of course given the opportunity the client may very well instruct you to do less work and therefore charge less. This happens all the time. Does the following sound familar? "We will not pay for first-year associate time." When you purchase a Mercedes (or a Honda Accord) do you feel the need to dictate who may staff the production line? Clients impose their will on the process because they often don't trust that their outside counsel fully appreciate the need to balance legal risk with budgets. Imagine, though, that the client is involved at the earliest stages and that all parties share common expectations for what legal tasks are necessary, for how long and at what cost (approximately), and imagine the client is fully aware of those areas where scope change of a significant magnitude is likely to occur, e.g., during due diligence, review by the regulating authority, if class cert is granted, and so on. Clients demand more for less when they believe absent any control we'll do more for more. LPM helps to manage expectations because everyone is aware of what's necessary in advance. Of course, we can never eliminate surprise but the client who feels fully informed at all points in the process will be far more tolerant of change than one who's surprised every month when the invoice arrives. So Legal Project Management means we'll bill less, and be less profitable? I'm a big believer that a financially healthy law firm is good for everyone, and there's nothing wrong with the Biglaw focus on profits if this focus doesn't interfere with the clients' needs. But let's clear up a few misperceptions. Just as many of us grew up with the notion that our home values will always increase, Biglaw partners have grown up with the notion that profits only result from high billable hours multiplied by ever-increasing billing rates. There are even some who believe the ACC Value Challenge will result in lower compensation for outside counsel. Hogwash! Every other industry in the world operates under an assumption that another equally viable path to profitability is by lowering costs. And we're not just talking about eliminating free soda. If a client were to pay less because the firm put the client's interests first and determined that the legal issue doesn't need as much lawyering, we'd very likely see an increase in realization rates, we'd reduce the opportunity cost of assigning lawyers to tasks that ultimately will not be billed, we'll engender client loyalty and reduce our cost to acquire the next matter (the cost of sales). These are plenty of ways to apply simple grade school math to illustrate this point. To be clear, things are changing. But change doesn't have to mean lower profits. Does Legal Project Management help or hurt under an Alternative Fee Arrangement? As described above, the new math of law firm profitability means lowering the waste and inefficiency we create by performing legal work that cannot be realized. Imagine if there's a capped fee in place, then any waste and ineffiency directly reduces the firm's profitability. While there are many flavors of Alternative Fee Arrangements (AFAs), essentially they all require that the firm operate more efficiently, and absent a disciplined, rigorous approach like LPM then it's likely, bordering on guaranteed, that the firm will experience profit dilution and view AFAs with skepticism. For my consulting practice, an AFA is a primary catalyst for embracing LPM; but the concepts apply equally as well in a billable hour scenario, even more so in an environment where the competition is creating downward fee pressure. Do we need certified project managers? Can our staff do this? The first caution is to understand that LPM is not a technology initiative, it's not something that can be delegated to someone else in the same way that law firms hire experts to handle Public Relations or to update the website or to manage the cafeteria or to tend to the grounds. So often law firms treat business processes as technology initiatives. Knowledge Management (KM) is about capturing and sharing knowledge to better train our lawyers and serve our clients, yet most law firms treat it as a database problem for the techies to figure out. Client Relationship Management (CRM) is about understanding our clients, yet most law firms treat it as a mailing list issue owned by Marketing. LPM is about better serving client needs by setting proper expectations, by providing the right legal services, and by dealing with change. These are not tasks to be delegated, but tasks that client-facing partners must embrace. Of course, when LPM involves creating pretty charts and graphs to show our progress on the project plan, then of course there are qualified people on staff who can do this more efficiently than a partner. Some firms have hired certified project managers, but by and large their focus is on understanding the historical costs of delivering legal services, an effort designed to inform the partners when making pricing decisions. LPM tasks can be delegated, but the partners must own the business process.